A quite amazing event took place in Kenya’s capital, Nairobi, on August 29 and 30. Two hundred representatives of non-governmental organisations (NGOs) from China and 19 African countries held a China-Africa People’s Forum. The event is remarkable from two standpoints. First, given the fact that, for the most part, China is still a statist country where the Communist party retains tight control, it is surprising that there are any non-governmental organisations (NGOs) at all. China’s restrictive laws, governing the registration of non-profit organisations, mandate that applicants be affiliated and sponsored by a governmental unit, and this effectively terminates NGOs that are not affiliated with the Government. But research reveals that there are some NGOs which operate with the blessing of the Chinese Government. In this sense they are regarded as "government-NGOs". It figures, therefore, that the Chinese NGOs, attending the Nairobi People’s Forum were ones that enjoy government support. The second reason that the event is itself remarkable is that China-Africa social and economic relations are a recent development. Yet the Chinese have shown enough interest in engaging African civil society to mount considerable participation in it. Even if the Chinese contingent enjoy Chinese Government endorsement and, therefore, may act only within parameters set by the Government, they still interacted with the African NGOs that are not tied to their governments. 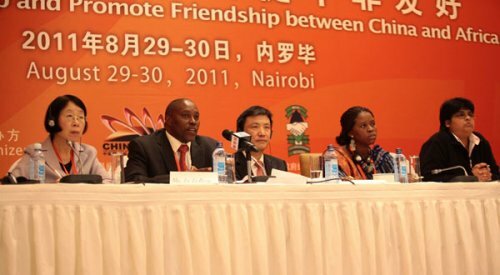 What the Chinese NGOs heard from the African NGOs were independent views. And it is now fairly well known that people in many African countries have expressed concern about the way that China and Chinese companies have operated in Africa. Some have gone as far as to remark that China behaves no differently than the old colonial masters — an observation that troubles China, given its official posture that China is a developing country that wants to maintain equality and solidarity with other developing countries. Of much older vintage is the relationship between African, Caribbean and Pacific (ACP) countries and the European Union (EU). That formal relationship by treaty is 37 years old. But the EU, which has a very vibrant civil society with which it consults regularly, has never organised a People’s Forum of EU and ACP countries. In other words, the civil society organisations of these two groups of countries have never been given the opportunity to help to define their relationship or to express their views on the structure and substance of the relationship as it has evolved through the Lomé and Cotonou treaties and now, the Economic Partnership Agreement (EPA) between the EU and many ACP countries. However tied to the Chinese Government the Chinese NGOs might be, at least China has opened its ears to hearing what NGOs in 19 African states have to say about the Africa-Chinese relationship. It may be that the EU Commission — and perhaps some governments of EU member states — are fearful of what their own NGOs would say about the EPAs that the EU has railroaded many ACP states into accepting. It is widely known that many NGOs throughout Europe, as well as several members of the European Parliament, are critical both of the unfairness of the EPAs and the manner in which the EU Commission handled the negotiations. ACP governments are not blameless in this. They have not insisted on a forum in which civil society organisations from their own countries and the EU can meet to exchange views and comment on the relations between the two areas. In part, this is due to the suspicion that many governments and NGOs of ACP countries harbour toward each other. However, it is a suspicion that both sides should work to overcome, for the governments of developing countries will not be able to stand up against unfair conditions set by countries and agencies such as the EU Commission, the International Monetary Fund and the Organisation for Economic Co-operation and Development unless civil society organisations share their concerns and are willing to advocate them within their local communities and internationally. ACP countries should take the initiative to push for an ACP-EU People’s Forum. The next meeting of EU-ACP parliamentarians would be a good place to advocate the idea. The ACP Secretariat could draw on the experience of the 19 African states that participated in the forum with China for assistance in fashioning the forum. Such a forum might well produce a movement by people across the EU and ACP nations to establish a more equitable and just trade and economic relationship. It would also be useful to hold a people’s forum between China and those Caribbean countries with which it has diplomatic relations. There is good reason for it. Rumblings have already developed about the manner in which China is operating in the Caribbean, particularly over its insistence on Chinese labour for projects, including those which it funds by loans and not by grants. Concern has also been expressed about Chinese companies ignoring labour laws in the countries in which they operate. These grumbles should be addressed before they sour the relations between China and the Caribbean. A people’s forum would help to address these growing concerns and establish mutual understanding. In early September, the third China Caribbean Economic and Trade Co-operation Forum will be held in Trinidad and Tobago. It will be a limited meeting. Only nine of the 14 independent Caribbean Community (Caricom) countries will be represented. Five other Caricom countries that retain diplomatic ties to Taiwan will not be there. And while there will be representation by government ministers and business people from China and the nine Caricom countries, there will be no wider people’s forum of civil society representatives such as was held in Nairobi between China and African countries. In Nairobi, the people’s forum declared that they "believe that NGOs, as an indispensable force in the world today, have joined the government in providing public services, in community development and harmonising social relations by providing varieties of volunteer jobs". They said, "The role of NGOs is unique in international affairs, as they make their voices heard on different international platforms." And they concluded, "We realise that meaningful development can only be achieved through meaningful partnership between NGOs and their respective governments, and by various NGOs around the world." That statement applies equally to the wider African, Caribbean and Pacific Group.